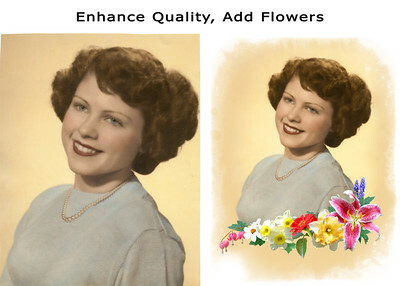 Have a cherished image you want restored? 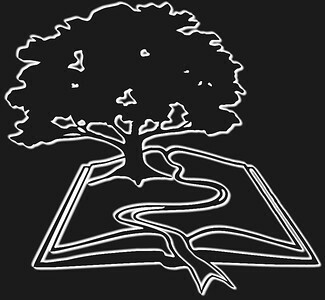 Give us a try - you'll not be disappointed. Here's a sample of a family portrait; the center people and spaniel were removed to create a portrait of my husband and I with our dogs. 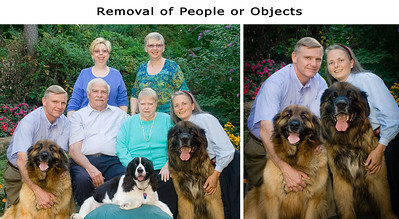 Just about any object, including people, can be removed from images. This interior image was taken hand held, for its interior. However, the auto setting on his camera picked up on the outside lighting. I adjusted the interior lighting, enhanced colors, sharpened the image, while slightly toning down yet retaining a natural look to the outside lighting. I scanned this very old image from an ordinary quality photocopy of a very very yellowed very old image. Much work was done to restore the color, bring out details in the faces and clothing, and to better contrast the background from the subject. 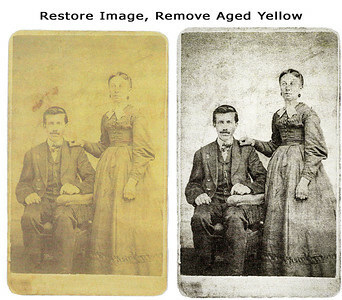 After removing the yellow, the resulting image revealed many scratches and spots that also needed restoration. The goal was to 'restore' the image, without removing the 'old' look and feel, so some of the age marks and tattered areas were allowed to remain. L-R, front: Peter Charles, Justin Brazil, Leah and Sean DuPont, Swainee Rosario (later Dellaquila), Bambi Tannibaum (later Kaan, in pink) and Matt Opanowitz (purple tie). Middle: Nicole Charles (blue), Amber Montieth (black), Marchet Delancy (indian brown), Heather Allem (black), Eric and Mece Clark (maroon velvet), Steph and Les Bartek (behind Mece and Beverly), Beverly Schockler (green), Jen Rekuc (brown), Laura Aversano, (blue). 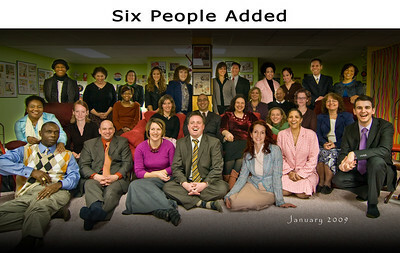 Back: Carla Thompson, Roseann Gibbins, Melissa Ofori, Alyssa Byrd, Alice Rosario, Jessica and Bryan Gaughan, Yakini Cooley, Kelly Lara, Bob and Jane Colabaugh. 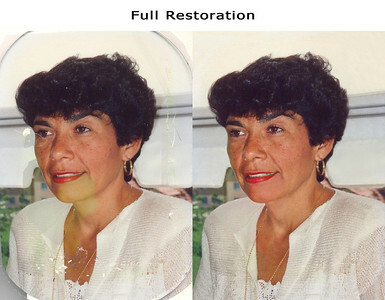 An eye for detail followed with meticulous care was required to restore this old damaged photo. Here are just a few of the 26 adjustments: Four corners needed to be recreated where it was cut to fit an oval frame. Photo was ‘chipped’ off creating white spots in chest area - needed recreation. Lengthy circular crack below eye, created from water spot, needed repairs. Numerous ‘dust’ spots needed removal from the hair. Large greenish water spot at cheek, chin and shoulder required 5 stages to remove and color balance. Repairing the background required numerous adjustments. Chair necklace also required repairs. Whiten eyes and teeth. Overall color balance, richness, brightness and sharpening needed adjustments. This very old image was in an oval frame with a convex piece of glass. The backing did not allow the image to be removed for scanning. A dozen shots of the image with all different lighting sources were taken, including no man-made lighting. After comparing all the images, the two that were chose to start from had lighting issues at opposite ends. These images were combined to take the best of each. 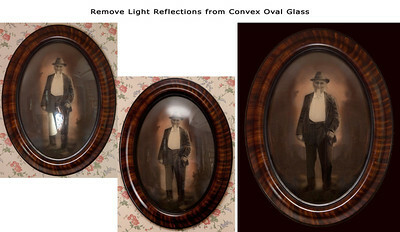 However, there were still many areas needing meticulous attention to restoration; for example, even when the lamp was turned off, the lamp shade remains clearly visible over his right leg, also all images show the stair way reflecting on the right side of the glass and the stair ceiling above that, and the window in his right arm. There were many other small things that could not be repaired from other images, but needed removal by hand-creating restoration from scratch. Also, the wall paper was removed and changed to a dark color that complimented the image without distraction. Do you have an image impossible to scan, difficult to photograph? If so, please ask us for suggestions on digitizing it. We're here to help. This old photo was hand-colored years ago. I applied some sharpening, color enhancements, brightening of eyes and teeth. For many years, this beautiful woman, was known for her love of making flower arrangements. So I added a spray of flowers, some of which were taken at her home. I also added the graphic edge to the existing background. The photographer stood looking down on his subject and did not zoom in to fill the frame. It's amazing how cropping in gives the 'feel' of being closer to eye level with the subject! We enhanced the clarity and sharpness, 'hand-painted' the flesh tones, lips and eyes for both, and colored the boy's bib overalls. For the final touch, we added the vignette to make the mother and son the focal point. 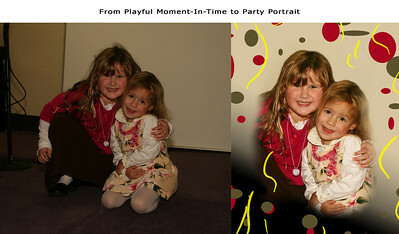 Children this age, in the middle of playing, are hard to get to sit still and look natural; The solution is to photograph many moments, pick the best, then edit: In this case, hair was fixed, lighting was increased, and a playful party theme was graphically added to remove unwanted objects around them. A relative knew cute when she saw it, and thankfully captured it for future generations to enjoy! 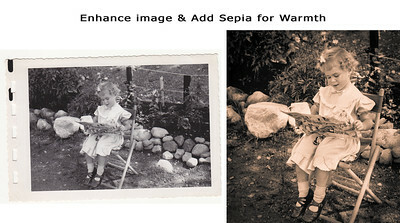 We added sepia to warm up the image. Cropping in, helps the viewer to feel a little more eye level with the girl while removing all the unnecessary distractions of stones, fence and bush.